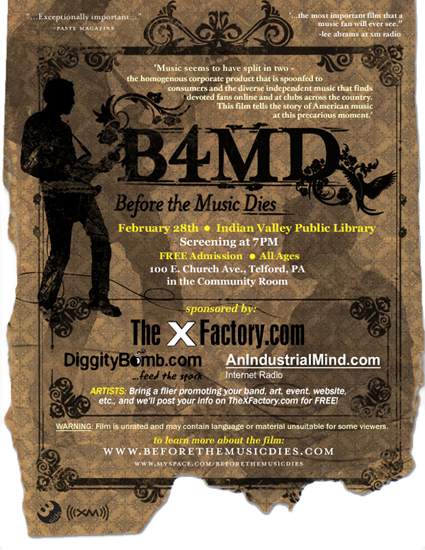 TheXFactory.com is proud to present “Before the Music Dies,” an independent documentary about the current state of music and where it’s heading. 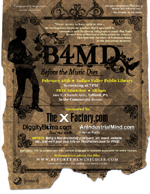 We invite all music lovers, musicians, and artists to come watch, learn, and support the independent movement for FREE. Bring a few friends, and a bean-bag or pillow! Coffee provided. *Artists: Bring a flyer promoting your band, art, event, website, etc., and TheXFactory.com will post your info on TheXFactory.com for FREE.